Spring 2013 is a little stressful, huh? And by a little, I mean a lottle. Don't worry—we'll get through this together. Kenyon students are back on the Hill after a summer of tackling challenging internships, engaging in volunteer work and immersing themselves in unfamiliar cultures. The Kenyon celebration of the life of Martin Luther King Jr. opens with a day of service. A student club and a building, Horn Gallery offers students space to practice and play. Kenyon arranges shuttle service, cuts KAC and library hours. Relationships expert Harlan Cohen visits campus just in time for Valentine’s Day. Making a film about the gay-marriage debate, Becca Roth '10 tackles a larger issue: the need for people to talk. On any given Tuesday or Wednesday afternoon around 4:00 p.m., there’s an office on the third floor of Peirce, all the way at the end of the hall, that’s starting to bustle. This is the office of the Kenyon Collegian. Stewart Huntsman ’16 perfects his aim as a member of the archery club, one of Kenyon's 150-plus student organizations. Kenyon is a national leader in cultivating the local-food market, and putting that food on the table for students. The Week of Sustainability focuses on the many aspects of environmentalism. A poverty simulation coming to Kenyon this week hopes to raise awareness of economic inequality. 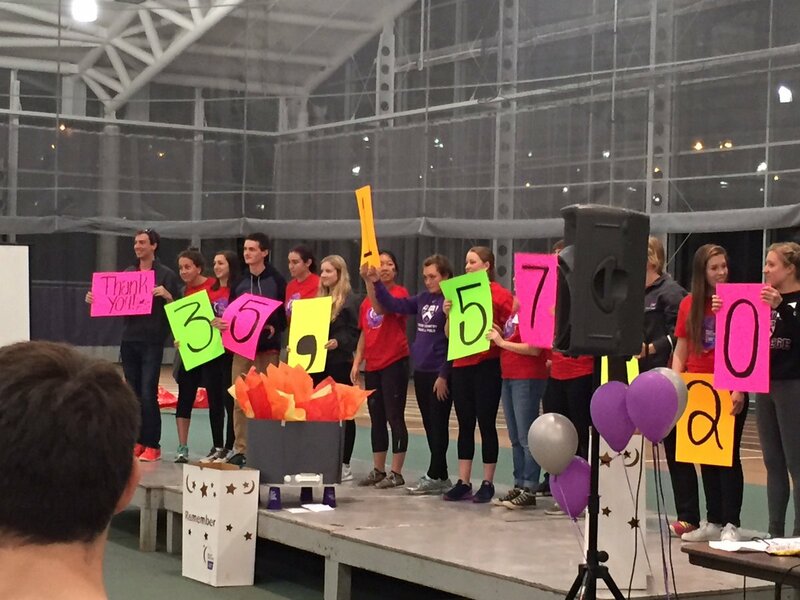 An all-nighter at the Kenyon Athletic Center raises money for cancer research. Kenyon students take a peer-to-peer approach to mental health. Collegian staff writer Phoebe Carter '17 interviews author and humorist Bill Bryson, who will deliver the Commencement address on May 17. Kenyon will add a vice president for student affairs to build on management strengths in the division that guides student life. Picnic combined orientation tradition, Gund exhibit and local harvest. The Class of 2018 moves in and officially joins the Kenyon community at Convocation. Kenyon's dining program receives distinction from the Green Restaurant Association for its sustainable practices. Breaking Bad star RJ Mitte talks about his life, career, and mission with Matthew Eley ’15. Kenyon buzzes as the first snowfall of the year blankets campus. The Owl Creeks ring in the season with a holiday serenade underneath the upside-down tree. Students organize "Unsung Heroes" week to thank the individuals who keep campus running in the winter. The Kenyon community rallies around a fundraising event to honor cancer survivors and victims. Twice-daily bus service to the airport and Columbus keeps students connected. The Class of 2019 moves in and officially joins the Kenyon community at Convocation. A Kenyon alumna is ready for the challenge of connecting people of all beliefs in her new role as College chaplain and leader of an Episcopal parish. Kenyon students say Take Back the Night in the fall gets the word out right away to first-year students. Students and families enjoy autumn hues and outdoor fun at the Brown Family Environmental Center’s Harvest Festival. Vice President for Student Affairs Meredith Harper Bonham ’92 talks about student health, the first-year experience and other top priorities for her office. Members of the Kenyon community stage a sit-in at Peirce Hall to raise awareness of racial intolerance on college campuses. A Kenyon shirt helped save the day for weary traveler Katie Jimenez-Gray '18. Students try to take the chill out of February by bringing back Philander’s Phling dance. Kenyon students, faculty and staff share photos of a morning snowfall in Gambier. The Gund Gallery takes residence hall decor to the next level with a new art-loan program. A recent Relay for Life event at Kenyon reminds Katie Jimenez-Gray '18 of the importance of supporting cancer patients. Chiddy Bang and Rubblebucket headline Summer Sendoff festivities. As members of the Class of 2020 prepare for their Kenyon debut, Phillip Gray Clark '17 offers five tips for making the most of Orientation. A Kenyon junior reminisces about those first few days of new faces and surroundings on the Hill. Follow the social media activity on the Hill as Kenyon moves in and formally welcomes the Class of 2020. The cultural organization for Latino/a students celebrates 30 years and leads Kenyon’s Latinx Heritage Month festivities. Kenyon's Class of 2020 includes many talented first-year students, including jump rope champion Anushka Patel '20. Before heading home for Thanksgiving break, Kenyon students at the annual Peircegiving feast reflected on what they're thankful for this year. Kenyon students bring holiday spirit to campus with a radio play adaptation of "It's a Wonderful Life." Kenyon's Unity House provides a safe space for LGBTQ+ programming on campus. Over 160 members of the Kenyon community traveled overnight by bus to attend the Women's March on Washington. Harper Beeland '20 reflects on the Kenyon curriculum's tendency to come full circle. Sendoff represents a different rite of passage for each group of students involved, but one aspect of its significance is consistent across classes: summer is almost here. Frustrated by gun violence in America, Emma Welsh-Huggins '17 revitalizes a campus group that pushes for gun sense legislation. Members of the Class of 2021 captured Move-In Day, Orientation Week, the First-Year Sing and more through social media. An alumna of the Kenyon Educational Enrichment Program reflects on the program's importance to her and an entire generation of Kenyon students. New spaces to enrich student life open in the Village of Gambier thanks to the support of alumni donors. “Finding a place to call home, a place you can claim as yours, makes all the difference,” writes first-year student Tariq Thompson. The new director of Kenyon’s Health and Counseling Center explains his plans to keep Kenyon feeling good. Emma Sniegowski ’18 explains the benefits of dropping in for a chat with Kenyon’s friendly and accessible faculty. Kenyon students protect their Knox County community through service as volunteer firefighters. Students, faculty and staff take to Instagram to share the beauty of winter in Gambier. Black artists from across the country visit Kenyon to honor Black History Month and Kenyon’s first African American graduates. A new student-run publication highlights the beauty of the Spanish language and the perspectives of the Latino/a community. Kenyon recognizes the achievements of students, faculty and alumni at the College’s annual Honors Day ceremony.